This Mumbai-based player is this year’s World Poker Tour India Champion. Nikunj Jhunjhunwala won the 2018 WPT India No Limit Hold’em Main Event at the luxurious Deltin Royale Casino in Goa. He outlasted a record field of 697 players over 4 days of action to secure his largest live cash winnings. The second edition of WPT India shattered attendance records by drawing huge participation from players all over India and collected the mammoth prize pool of Rs. 3,62, 49,576. It was not an easy victory for Nikunj as he had to face a number of formidable opponents at the final table such as Vidur Singhal, Akshay Nasa, Adda52 Team Pro Amit Jain, and Deepak Singh. The final table witnessed a fierce battle between the last few remaining competitors. The table was formed after Yuvraj Chaudhary took his leave at the 10th position. Nikunj came into the table with the shortest chip stack (Rs. 1,460,000). The field lost Amit Jain at the 7th and Deepak Singh – who was the chip leader at the starting of the day- at the 4th place. The heads-up began when Vidhur Singhal eliminated at the 3rd place. Nikunj Jhunjhunwala began the heads-up play with approximately 10.35 million chips to Sahil Mahboobani’s 10.51 million. Nikunj was short-stacked at one point (Sahil had 3-1 chip lead over Nikunj) but he mounted a comeback by putting Sahil under pressure and ultimately secured the victory. Sahil went all-in with K (Diamonds) and 8 (Spades) in hand. Nikunj called the bet with 5 and 9 of Spades. The board revealed Q (Diamond)10(Diamonds)5 (Hearts) 9(Diamonds) 8(Clubs). Nikunj hit the two pair which etched his name into the history of poker. Sahil earned Rs. 4,653,000 ( $64,444) as the second prize. It is the biggest win of Nikunj’s poker career. Before this tournament, his most substantial cash winning was in November 2015, when he took down both the IPC (Indian Poker Championship) Main Event and NLH Highroller for over $50,000. 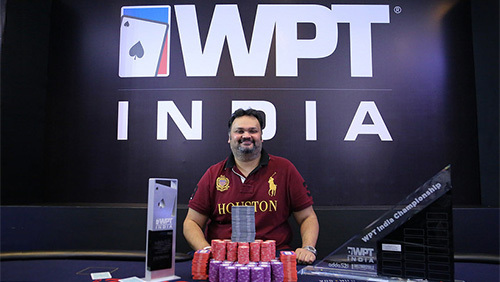 Last year, Vikas Mantri won the inaugural WPT India Main Event by topping a field of 527 players. He took home the champion title along with Rs. 6,030,000 (Approx. $92,000) first-place prize money. Adda52 congratulates Nikunj Jhunjhunwala for this astounding win and wishes him luck for all the future endeavours.